Born in Annaloghan, County Tyrone, Ireland. He immigrated to the United States in 1817 following his father Patrick Hughes. Working in quarries, mending roads and as a gardener in Chambersburg, PA. After several unsuccessful applications for admission to Mount Saint Mary’s Seminary in Emmitsburg, Maryland, young Hughes was given a job as seminary gardener until a vacancy came open. After ordination, Father John Hughes served in a number of churches in Philadelphia and gradually emerged as a leader and fighter. He attracted attention by his controversial writings and speeches. At a time when many Catholics thought it best to suffer the bitter anti-Catholicism of the day in silence, Father Hughes believed in outspoken vigorous defense. He used controversy to make the critics of Catholicism more cautious and to give a much needed morale boost to Catholics. He was a man of deep convictions. He consistently opposed any suggestion that Catholicism was an obstacle to civil and religious liberty and vigorously defended the basic harmony between Catholicism and American political institutions. He felt it his duty to prove that American Catholics were in sense second-class citizens. He was the fourth Bishop of New York City and it’s first Archbishop. His works included the founding of Fordham University, the current St. Patrick’s Cathedral, the paper’s Freeman’s Journal and Catholic Herald, the Immigrant Bank for new Irish and Catholic’s in New York and the formation of the Catholic parochial school system in America. He publicly defended the Church during the “Know –Nothing” movement of 1800’s and was President Abraham Lincoln’s personal agent to France-Rome and Ireland during the Civil War. An example of Archbishops courage and defense of Church is seen in the anti-catholic riots in Philadelphia in which “know-nothing” followers had burned churches, schools, and assaulted priests and catholic. Archbishop Hughes called surrounded the churches of New York City with a contingent of one to two thousand Irishman, members of the Ancient Order of Hibernians ALL. To the anti-catholic mayor of New York James Harper the admonition “that if one Catholic Church in New York is attacked or burned, the city would become a second Moscow” Not a church was touched. 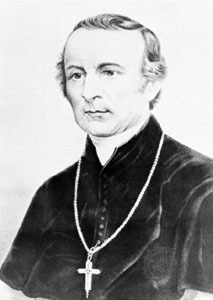 Archbishop Hughes passed away in 1864 after a long illness and is currently buried in St. Patrick’s Cathedral New York City. As Archbishop Hughes praised the men of the AOH “ who feel no consciousness of inferiority to any portion of their fellow citizens, but who are, in every sense of the word thoroughly American.” We honor his name and spirit with the naming of our division in his honor. Mr. Henehan lead a distinguished career during his lifetime. First as plant superindendent of the Seattle Frog & Switch Company, Pacific NW Manager of de Frenery & Co. Investment Firm, Claim agent King County King County District Attorney Ofice, Senior Examiner King County Auditors Office. He was also the campaign manager for future Govenor Warren Magnuson in his 1934 for district attorney. was State Senator for the 37th district 1943 to 1947.
to October 23 1998 when the Seattle Division was reborn.